Some people have a knack for taking a simple situation and turning it into something much more complicated. They might struggle to just look at things from the surface, since they always strive to dig deeper. This can be a good thing at times, but in some situations it is a bit troublesome. 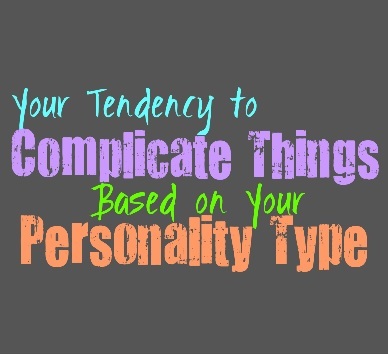 Here is how much you tend to complicate things, based on your personality type. INFJs do tend to complicate things a bit, since their minds are such complicated places. They might overanalyze even a simple situation, until it turns into something far more complex. They can see the different layers and don’t like having to just look on the surface. Their desire to see to the heart of things certainly makes the INFJ strive for things which can be more complicated than they completely need to be. Most of the time their complexities are what makes the INFJ intriguing and wonderful people, but at times it causes them to overlook when things can be simple. ENFJs aren’t necessarily great at simplifying things, they do have a tendency to make situations a bit complicated. While they care about the well-being of others, ENFJs just aren’t naturally drawn to the simpler things in life. They are more interested in understand what lies beneath the surface, and what really makes something or someone tick. The ENFJ interest in understanding the more complex nature of things, can sometimes cause them to complicate the situation more than it needs to be. INFPs do sometimes complicate things, only because they analyze and then analyze again. They have a tendency to take a deeper look at everything, instead of just accepting it for what it is. INFPs are analyzers and they enjoy really diving into things and want to get to know things on a deeper level. For the INFP just looking at the surface is boring and shallow, and so they want to really understand the many layers of people and situations. This does cause them to complicate things, since sometimes they are simply searching for the depth. ENFPs do have a tendency to complicate things a bit, sometimes just for the sake of curiosity. They push the limits and even the boundaries of those around them, since they want to see where this might lead. ENFPs analyze information and strive to understand what is beneath the surface. They have a tendency to complicate things simply by being themselves, since they aren’t focused on things that are too simple or uninteresting to them. INTJs tend to look at things the way they are, but they do prefer to dig deeper to uncover the facts. They don’t make depth where it isn’t though, and likely won’t complicate situations. INTJs focus on facts, which are often rather simple and upfront for them. They don’t believe in trying to force something or make a situation much more complex than it actually is. For the INTJ it is better to uncover the truth of the situation rather than to make the situation complicated when it shouldn’t be. ENTJs don’t tend to complicate things, instead they want to look at the facts of the situation. For them it is important to look at things how they are, rather than try to get something that just isn’t there. They focus on uncovering the truth and believe that information is truly important. For the ENTJ facts are vital, but this does not mean they should overanalyze in a way that creates complicated which don’t actually belong in the situation. INTPs do have a tendency to complicate things a bit, simply because they overanalyze. They spend so much time diving into the situation that they can sometimes grasp at patterns with some missing pieces. This causes the INTP to complicate a situation that might be a bit simpler than they recognize. They simply want to dive in and learn everything they can but their overactive minds to have a tendency to complicate things from time to time. ENTPs do sometimes complicate situations, simply because they have such analytical minds. They will take a piece of information and analyze it and go over all of the angles, until it becomes a bit complicated. Most of the time this helps the ENTP to recognize patterns and uncover information which others are not aware of. In some situations this does cause the ENTP to complicate things, even in situations where it would be better left simplified. ISTJs don’t like complicating things, especially when they are already simplified. They prefer things which are direct and to the point, and complicating this isn’t something they enjoy. People who have a tendency to make something complicated, will be draining and even a bit frustrating for the ISTJ. They believe in looking at the facts of a situation and don’t enjoy having to dig underneath the layers when the truth can be found on the surface. ESTJs really don’t like making things complicated, instead they believe in looking at the more obvious facts of a situation. For the ESTJ turning something more complicated than it needs to be is a complete waste of time. They value efficiency, which for them means getting the job done to the best of their ability and also getting it done quickly. Wasting time and energy making something complex when the facts are right there, is just not something ESTJs enjoy. ISFJs don’t like complicated situations, instead they would often rather simplify them. They want to get things done and don’t like when complicated hold them back. For the ISFJ it can be draining when someone constantly wants to overanalyze and turn a situation into something far more complex than it needs to be. This is often because ISFJ have so much they need to take care of, and this includes the well-being of their loved ones. ESFJs don’t like to complicate things, they prefer when situations where simplified and easy to navigate. They prefer things they know and understand, mostly because they are perfectionists who want to get the job done properly. ESFJs care about their loved ones and strive to tend to their needs, and so they don’t’ like feeling like they will fail them in any way. Overanalyzing and turning things into something too complicated will only hold them back from getting things done. ISTPs don’t like complicating things when it seems like the answers are simple and easy to uncover. They do believe in looking at the facts and enjoy analyzing some situations. For the ISTP it is best to analyze when the situation calls for it, and not try to make things complicated when they don’t need to be. They enjoy focusing on the moment and soaking up their surroundings. For the ISTP trying to make everything too complex is a bit draining and pointless. ESTPs don’t usually like to complicate things, since they enjoy living in the moment without too many strings attached to them. Anything that weighs them down or holds them back from living their lives, is not often something the ESTP finds appealing. For them it is important to analyze information and look at the facts, but that doesn’t always mean going so far that it becomes too complicated. The ESTP wants to approach the situation from a factual point of view, without going deeper than needed. ISFPs don’t like things that are too complicated, instead they enjoy looking at what is in front of them. For the ISFP it is best to live in the present and enjoy the world around them. Having to constantly analyze and complicated a situation is definitely not rewarding for them. ISFPs sometimes prefer when things are simplified, so that they can look at it from a more sincere and upfront angle. ESFPs don’t like complicating things most of the time, since they prefer to look at what is right in front of them. They focus on what is on the surface and what they can actually see with their own eyes. For the ESFP having to constantly dig deeper into things can be a bit draining, especially when it feels like a wastes of time for them. They can be complicated people themselves, but that doesn’t mean they have room for other people wanting to complicate a situation.